Nearly 1,000 Americans are felled each day by a cardiac arrest. Most die, even though many are just inches away from life-sustaining treatment—someone who can do cardiopulmonary resuscitation (CPR). Someone like you. Don't know how? The American Heart Association, American Red Cross, and other organizations offer classes in almost every city in the country. You can teach yourself at home with the heart association's CPR personal learning program. In a pinch, you can teach yourself. 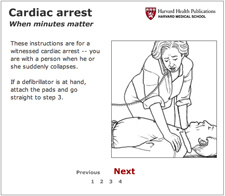 This page offers a step-by-step guide to doing CPR, information on using a defibrillator to jump start a heart, and other life-saving resources. someone with a cardiac arrest. The best way to learn CPR is to take a class. The easiest way to find one in your area is to look up online, or call, the American Heart Association (toll-free, 877-AHA-4CPR) or the American Red Cross (202-303-5000). If you like to learn things at your own rate, or in privacy, the American Heart Association has something for you. The Family & Friends CPR Anytime Personal Learning Program is a kit that comes with a videodisc, an instruction manual, and an inflatable mannequin so you can get the feel of doing CPR and practice at home. The AHA says the $35 kit can teach you the basics of CPR in just 22 minutes. Completing the lesson doesn't give you certification in CPR, but it does give you the skills you need to perform CPR if you ever need to. You can order the kit online at www.cpranytime.org or by calling the AHA (toll free) at 877-AHA-4CPR.